Poypiti Amatatham contributed reporting from Bangkok and Samut Prakan. A school in Bang Po, Thailand. Discipline and deference prevail at Thai schools, rooted in military dictatorships. SAMUT PRAKAN, Thailand — Put aside for a moment the image of Thailand that tourists often see, a laid-back, anything-goes country of libidinous night life. Nethiwit Chotpatpaisan, center, a student, started a Facebook campaign seeking to abolish the “mechanistic” education system. Thai students have an altogether different impression. In Thai schools, a drill sergeant’s dream of regimentation rooted in the military dictatorships of the past, discipline and enforced deference prevail. 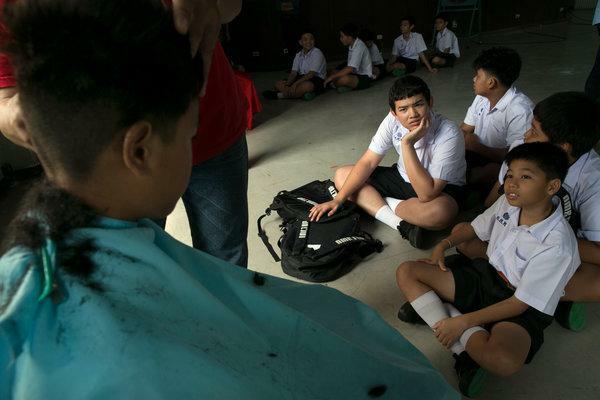 At a public school in this industrial Bangkok suburb, teachers wield bamboo canes and reprimand students for long hair, ordering it sheared on the spot. Students are inspected for dirty fingernails, colored socks or any other violation of the school dress code. Yet as the legacy of military rule fades, some students are rising up and challenging, with some success, a system that stresses unquestioned obedience. They have a receptive ally in a government that is seeking to reduce the military’s role in civic life and has proposed sweeping changes to the education system. Late last year, a freethinking Thai high school student, Nethiwit Chotpatpaisan, who goes by the nickname Frank, started a Facebook campaign calling for the abolition of the “mechanistic” education system. Together with like-minded friends, he started a group called the Thailand Educational Revolution Alliance. He rose to national prominence in January after speaking out on a prime-time television program. “School is like a factory that manufactures identical people,” he said one recent morning at his school, Nawaminthrachinuthit Triam Udomsuksa Pattanakarn, the same school where Mr. Arun is vice principal. Frank described the teachers there as “dictators” who order students to “bow, bow, bow” and never to contradict them. The group’s message has resonated, partly because he has found a measure of common cause with the country’s United States-trained education minister, Phongthep Thepkanjana. He has vowed to allow Thai schoolchildren to let their hair down — literally — and has proposed a raft of education changes to reduce what he says is an emphasis on rote memorization and to promote critical thinking. He has proposed less homework and fewer hours in the classroom, and a curriculum that would focus on the essentials of language, math and science. In the age of Wikipedia, he said, there is no sense in memorizing the names and lengths of obscure rivers in Africa, as he had been required to do as a student. A former judge who was trained as a lawyer at George Washington University, Mr. Phongthep said that encouraging students to form opinions and debate would be good for democracy in a country that has had numerous stumbles on its eight-decade journey out of absolute monarchy. “If students cannot voice their opinions in class, how can they exercise their freedom of expression in society?” he said. Earlier this year he announced he would relax the rule on hair length, which carries great symbolism here since it was enacted by the military government in 1972. The rule requires that girls have their hair cut just below the ear, and that boys buzz the sides of their heads like cadets. The new rules are pending approval by the Thai cabinet. The proposed changes go to the heart of the way schools work here. Studying longer and harder has long been considered one of the main ingredients for East Asia’s economic miracle, and is the model that Thailand, seeking to climb the ladder to the club of Asia’s wealthiest nations, has sought to imitate. Advocates for change say the current curriculum, packed with subjects to memorize, does not allow time for Thai students to think for themselves. He said the main resistance to change had come from the civil servants for whom revising the curriculum would be a gargantuan task. After that, a new curriculum would face a series of public hearings before it could be approved. In the case of the dress code, there are already signs that administrators might balk. Mr. Arun, the vice principal and strict disciplinarian, is considering flouting the new rules himself if they are too lenient. He and others say that maintaining discipline is essential to combat the social ills convulsing young people in Thailand — drugs, teenage pregnancy and gang fights. The greatest cheerleaders for change seem to be the students themselves. The group consists of precocious students who love to debate. One of them trolls scientific sites on the Internet for comments questioning the theory of evolution, and ridicules the posters as being unscientific. Another member hacked into the Ministry of Education Web site, confessed, and was hired by the ministry to beef up cybersecurity. Nutcha Piboonwatthana, 16, one of the few girls in the group, said she had a double mission, pushing for changes to the system and getting Thai girls, who are trained from an early age to be deferential, to be more adventurous. Earlier this year he announced he would relax the rule on hair length, which carries great symbolism here since it was enacted by the military government in 1972. The rule requires that girls have their hair cut just below the ear, and that boys buzz the sides of their heads like cadets. The new rules are pending approval by the Thai cabinet. Engaging and relevant article, Mid. Schooling system [and related factions] has been like this for some time now. Subliminal and caustic militarism have been an instinctive way of life within the institutional circles. the push for change from the students themselves and the enlightened attitude of Mr. Phongthep . At my school, hair regs have been relaxed for female students, but not males. I wish the Thai teachers at my school older than 40 would just disappear. We might get some actual work done. A bunch of aloof, self-important, delusional cunts they are.